Go up by bus to Machu Picchu. Machupicchu Guided Tour in 07:00 hrs to 09:00 hrs. Optional: Walk to Huaynapicchu or Sector Mountain (without guide). by bus to Aguas Calientes. A la carte lunch in the restaurant of Aguas Calientes. Transfer from the airport in Lima to the bus terminal to Paracas. Night at the hotel in Paracas. Transfer to the airport in Paracas. Flight over to the Nazca Lines. Travel by Bus from Paracas to Lima (19:05 hrs - 23:00 hrs). 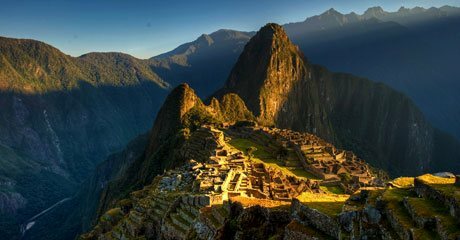 Peruvian tourists who have their valid ID receive a discount of U.S. 20 DLRS in the tour cost at the entrance to Machu Picchu. Train tickets roundtrip Ollantaytambo - Machupicchu - Ollantaytambo Inka Rail Executive Service. 1 Transfer from hotel to bus terminal in Cusco to Puno. 1 Transfer from the hotel in Puno to Juliaca airport (one hour).1 Transfer from airport to the bus terminal in Lima. 1 Tour to the Ballestas Islands and Paracas. Tour to the Sacred Valley of the Inkas This tour starts around 08:00 hrs., we pick you up at your Hotel, we have a guided tour to the Sacred Valley of the Incas, over the Vilcanota river, with a panoramic view of Pisac an old Inca City and a visit to the Inka market in this village, where we will have the chance to know in a closer way its people customs and get good bargains with the handycrafts and souvenirs sellers, afterwards we'll head for Urubamba, traveling on the borders of the river Vilcanota. Finally we will go to the Ollantaytambo train station to board the train that starts 16:36 hrs to Aguas Calientes, arriving averaging 18:09 hrs. Spend the night in hotel in Aguas Calientes (Machupicchu). (Photo: Valle Sagrado de los Incas). Tour a Machupicchu "The lost City of the Inkas" After getting up early and have breakfast, we climb to the Inca citadel of Machu Picchu. Then we'll star the tour guide to the citadel of Machu Picchu, visiting the Main Plaza, the Circular Tower, the Sacred Solar Clock, the Royal Quarters, the Temple of Three Windows and various cemeteries around for more than two hours. Optional: you can do the trekking to the summit of Huaynapicchu or the Mountain sector, this will take a few hours, in which you can enjoy the scenery and take some breathtaking views (This visit is without a guide). Then descend by bus to Aguas Calientes in the afternoon and take the train back to Ollantaytambo, where our staff will be waiting for you, to transport you by bus to Cusco and drive you to your hotel. (Photo: Machu Picchu). Tourist trip from Cusco to Puno , visiting Raqchi After breakfast, we will take you to the bus station to start with our trip to Puno this a tour lasts around 8 hours you will have 4 guided visits, Andahuaylillas's temple or South American Sixtine Chapel, the Inka temple of Raqchi, Buffet lunch in Sicuani,La Raya at 4335 m.a.s.l and the Inka Aymara museum of Pukara. Every visit has a duration of 20 or 40 minutes, where the passenger will be able to make questions, take photos and walk a for a while, doing our trip very pleasant .Then we wll arrive in Puno, and our staff will take you to the Hotel. (Photo: Raqchi). Tour to the Titicaca Lake, Uros island and Taquile Early in the morning you will be picked up from your hotel by our local guide and then transferred to the harbor. We start off our boat excursion of Lake Titicaca by visiting The Uros Floating Island, a small community that has lived on these reed Islands for decades. Centuries ago the small indigenous Uros tribe conceived of the islands as a way to isolate and protect themselves from rival tribes, the Collas and the Incas. The Uros people harvested the reeds in the shallows of the lake, bundled them together tightly and built floating island platforms complete with reed houses and canoes, creating in this way their own little world. After strolling around the floating Islands, we continue our journey towards Taquile Island (2 hour aprox. ), a traditional Quechua speaking community, full of ancient agricultural terraces and some ruins dating back to the pre-Inca times. The Taquile population was relatively isolated from the mainland until 1950s, and the notion of the community and family is still very strong among them. At the top of the Island, you will have free time to explore this place on your own and afterwards you will meet the group for lunch at one local restaurant. After lunch, we will descent to the harbor to take our boat back to Puno. We will be back in Puno by 17:00 hrs approximately. Transfer to Juliaca airport, flight to Lima and trip by bus to Paracas Very early after breakfast in the hotel, we'll pick you up and transfer to Juliaca airport which is about an hour from Puno, there you can display your ID in the airport counter and then take the flight to Lima. At the airport in Lima, we will be waiting with your name, then transfer you to the bus terminal in the tourism company that will take us from Lima to Paracas, a trip that lasts about 4:30 hours, we arrive to the city of Paracas, where we will be waiting for you, after welcoming the transfer to hotel where you spend the night tonight. (Photo: Chullpas Sillustani in Puno). Flight over the "Nazca Lines" After having breakfast, we'll transfer you to the harbor of Paracas, where we started the tour to the Ballestas Islands passing through "The Candelabro" a giant picture on the side of a hill. Arriving at the Ballestas Islands, will visit the different islands for two hours, watching the different species of sea lions, seals, penguins and seabirds. After arriving at the port will make the tour to the Paracas reserve. In the afternoon we head to the airport in Paracas where we board the plane for a 90 minutes on the Pampas of Nazca, where the ancient pre-Inca drew huge figures of animals and plants not yet discovered an end, many believe that these figures were made by extraterrestrials, among which are the monkey, the spider, hummingbird, etc. .. 20:05 hrs to hours then we will return to Lima, arriving at approximately 00.00 hrs, our staff will be waiting for you and transfer you to Lima airport or your hotel. (Photo:spider of the lines of Nazca).